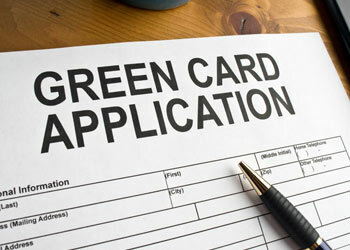 This article will explain how to get a green card for your spouse. As a U.S. Citizen you may obtain a green card for your spouse. The procedure you use will be based on where she is located. If she is in the United States, and she entered the country legally (see below) then you would go through a process called adjustment of status. That is what this article is about. If she is outside the United States then you would file a petition for her while she is abroad. This process should take about 12-14 months. However, time lines are in a state of flux and can vary. Either way you should consult with a qualified immigration attorney prior to filing any paperwork with USCIS as you can have serious long-term problems if paperwork is not completed correctly or your case is improperly filed. Again, if you did not enter legally you may be still eligible to file for their green card. However, this is a complicated area of immigration law. If you entered illegally then you should definitely consult with an immigration attorney prior to proceeding with the case. Failure to do so could lead to removal (deportation) from the United States for 3 to 10 years. To obtain a green card through marriage you must make sure that you are currently legally married. If you got married outside of the United States you must make sure you followed the laws of that country concerning marriage and that the marriage is legal in that country. Also, to have a legal marriage your prior marriages must have been terminated prior to your current marriage (divorce, death annulment). There are a surprising amount of people who believe that a “prior” marriage has been terminated when in fact it has not been terminated. Generally these people filed for divorce but did not properly finish the divorce process. If you are not sure your divorce is final you should consult with a family law attorney. Because you are a U.S. Citizen your spouse will be able to get a green card in the United States quickly. The process should take only 6-12 months. Most of our cases process from start to finish within this time. However, this waiting period seems to be getting longer. Do not be alarmed if your case takes a bit longer than 6-12 months. The burden will be on you to prove to USCIS that your marriage is legitimate. You will need to file the appropriate documents with USCIS and do well at your marriage green card interview. As a part of the case USCIS will require that the U.S. Citizen prove that he can financially support his spouse. The U.S. government does not want the immigrant to file for welfare or other pubic benefits. The U.S. Citizen will need to provide 3 years worth of federal tax returns, a letter from his employer showing that he is currently employed and his current income, and current bank statements. If the U.S. Citizen is not currently working the requirement can be met via a co-sponsor or by showing USCIS that you have sufficient assets to meet the requirement. You should receive a receipt notice from USCIS a few weeks to a month after the case has been filed. The next step in the process is biometrics. USCIS is taking your biometrics as part of the security background check it is doing in the case. About a month before your interview you will receive an interview notice from USCIS explaining the date, time and place of your interview. You will also be told which documents to bring to your interview. While the case is pending you will receive a work/travel card. Do not leave the United States while the case is pending if you had been out of status for more than 180 days prior to filing your case as you will not be let back into the country and you will likely not be able to return to the United States for at least 3 years (possibly 10 years). I strongly suggest you consult with an experienced immigration attorney if you would like to travel outside of the United States while your case is pending. If all goes well at the interview , the green card for spouse case will be approved and you will receive your green card in the mail in about 30 days. If you are fortunate the wait time can be shorter than 30 days. Congratulations!